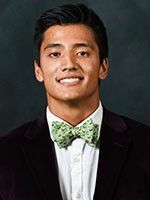 2017 Archmere graduate Nicholas Salameda, a member of the Colgate University Class of 2021, has earned the fall 2018 Dean's Award for Academic Excellence. Students who receive a term grade point average of 3.3 or higher while completing at least three courses earn the fall 2018 Dean's Award for Academic Excellence. Aside from his academic interests, Nick is a Midfielder on the Colgate University lacrosse team. He signed his letter of intent to join the lacrosse team his senior year at Archmere. Colgate is a Division 1 athletic program. Nick's current major is Political Science.